After many years of fertility struggles and heartbreaking miscarriages, Rob and Anna proudly share their London town home with their young son, Jack, and Rob feels like he is on top of the world. But in the words of songwriter Gilbert O’Sullivan, life has a way of throwing life off-balance: “[A]s if to knock me down / reality came around / and without so much as a mere touch / cut me into little pieces.” When Jack is five years old, he is diagnosed with a brain tumor. At first, it appears to be serious but not fatal. He needs surgery, but it’s not malignant. There’s a chance it could come back, but they will monitor him carefully. After an involved surgery and recovery, Jack is raring to get back to his normal life, having fun with friends and returning to school. "Luke Allnutt’s gut-wrenching debut will bring you to tears while also challenging you to think about the lengths you would go to save a child." But reality is coming around for Rob, Anna and Jack. And it doesn’t bring good news. Jack’s tumor recurs, and this time it’s cancerous. Now finding themselves in this uncharted territory, Rob and Anna are being tested in more ways than one. Their will is tested, their marriage is tested, and their faith is tested. Trying to adjust to this “new normal,” Anna throws herself into work. Rob finds some solace in Hope’s Place, an online forum dedicated to offering advice and comfort to parents of children with cancer. On there, he learns about a controversial doctor in Prague and his clinic that could be the answer to his prayers --- a miracle cure for his son. Although the webmaster is quick to point out that they do not sanction this doctor’s questionable treatments, Rob indulges in some “magical thinking” and believes that perhaps this is the only way Jack can be saved. But Anna doesn’t agree. When faced with the unimaginable, who wouldn’t want to grasp for any sliver of hope? Luke Allnutt’s gut-wrenching debut will bring you to tears while also challenging you to think about the lengths you would go to save a child. The idea for the book came to Allnutt when he was diagnosed with colon cancer in 2013. This moving novel is a natural for book groups, as you’ll never want for in-depth and enlightening discussions about how far you would go to save a loved one, and dealing with the repercussions thereof. 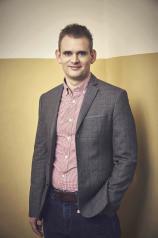 Early on in the story, Anna tells Rob, “You’re exasperating sometimes…. 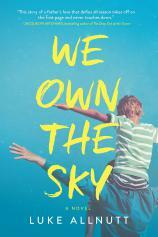 You’re always so absolutely certain you’ll get what you want.” WE OWN THE SKY is about what happens when you don’t.